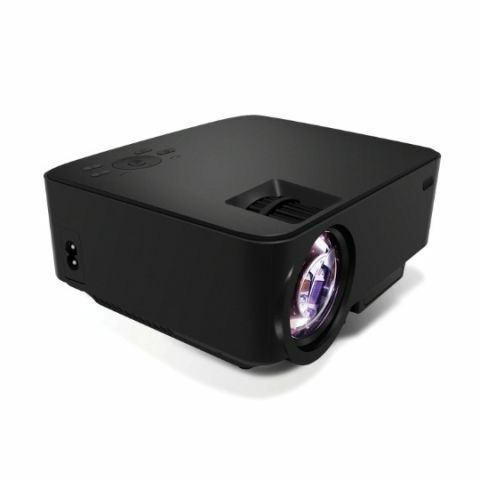 Portronics has launched the BEEM 100, which is a 100-lumen, 800 X 480 resolution projector. It is available at a price of Rs 9,999 both online and offline. It has the ability to project multimedia content from a variety of sources on a screen size of upto 100 inches diagonally. The Beem 100 connects to DVD players and supports RGB (AV) NTSC/PAL devices. It also comes with micro SD card, USB drive and supports HDMI enabled devices. Portronics, based upon the success of PICO-318 portable LED Projectors has announced the launch of ‘BEEM 100’. It sports a 100-lumen, 130-inch screen-size along with 800 X 480 resolution. It exhibits excellent picture quality and has the ability to project multimedia content from a variety of sources on a screen size of upto 100 inches diagonally. If you enjoy movies with family & friends in the informal comforts of your home but require a theatre-like experience or if you are a gaming wizard and want to fully immerse yourself in a 100 inch screen size as you play on your PS3, PS4, X-Box or PC, just connect your consoles to the HDMI port of Beem 100 to enjoy a rich and seamless experience. You can also easily stream HD videos from Youtube, Netflix, etc. You also get an option of routing the audio through your home-theatre or sound system via aux out to make your experience richer. The Beem’s diagonal screen size ranges from 34 inches from 1.5 meters upto 100 inches from 3.8 meters without producing blur on edges. Through HDMI /MHL Port, it can support the highest resolution upto 800 X 480 and a contrast ratio of 1000:1. The portable projector also supports all major image, audio & video file formats along with an inbuilt 2W speaker. The additional features like inbuilt focus, tilt adjustment through digital & optical image normalization helps digital & optical image normalization. It also comes with a multifunctional Remote Control with like Play, Pause, Stop, Fast Forward, Reverse, zoom and much more.